Welcome to Park Lawn’s Bingo. Our handicap accessible location offers players a top quality bingo playing experience. Four rooms are available for your bingo playing pleasure. We offer a full service kitchen with plenty of parking and security. 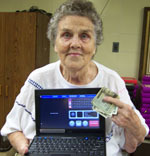 Proceeds from bingo benefit individuals with developmental disabilities at Park Lawn. Must be 18 to play. Contact Kathy Dehlin at 708-425-3344 ext. 242 or kdehlin@parklawn.com for more information. A variety of pull tab games are available each day. Hands free computer dab themselves! Volunteers needed weekly. Call 708-425-3344 to sign up today!